Big Tobacco Seeks Safer Cigarettes While there is still a market for cigarettes — nearly 1 in 5 American adults smokes — that number has been steadily decreasing. So tobacco companies are investing in technology and research that could create a safer cigarette. Legislation pending in Congress would give the Food and Drug Administration jurisdiction over the tobacco industry. One part of that bill could mandate large warning labels on cigarette packs similar to those found in other countries. See Cigarette Warning Labels From Around The World. Call For Philip Morris: A History Of The Tobacco Giant's Advertising Campaigns. 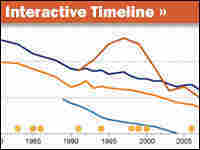 Trace Smoking Rates And History Over The Past Half-Century. The tobacco industry has changed a lot in the past 50 years. While there is still a market for cigarettes — nearly 1 in 5 American adults smokes — that number has been steadily decreasing, prompting tobacco companies to invest in technology and research that could create a safer cigarette. Tobacco giant Philip Morris has staked its future on its Center for Research and Technology in Richmond, Va. With its whimsical, bright-colored furniture, the $350 million compound more closely resembles an art school than a research facility. The glass building boasts cantilevered stairways, quirky activity stations and Pablo Picasso quotes near the elevators — all aimed at stimulating innovation. Most of the scientists sit in the center of the building or, as Rick Solana calls it, "the canvas." "What they've been working on here recently is the sensory and the flavor impact of product designs that have the potential of being reduced-risk cigarettes," says Solana, Philip Morris USA's senior vice president for health sciences. Solana says some of the company's earlier attempts at marketing these kinds of products failed. One example is Accord, a cigarette that was electrically heated instead of ignited by fire, designed as a stubby cigarette that was placed into a silver lighting device that resembled a digital thermometer. "A lot of technology went into [Accord]," he says. "But what we learned in the end was we missed the mark, because we didn't pay attention enough to the consumer. This was way too different of a way to smoke. It has the potential scientifically to become a reduced-risk product, but without consumer acceptance that wasn't going to be realized." Solana says test-market smokers also rejected cigarettes that used carbon filters to reduce smoke exposure. In the center's smoking lab, machines — not humans — are the ones trying out new cigarette designs. One resembles a computer hard drive, and it takes measured puffs from a Marlboro cigarette. The smoke is then captured and broken down for researchers like Ila Skinner to analyze in a process called gas chromatography mass spectrometry. "You might see this on CSI," Skinner says. A computer screen gives her a reading of the molecules in the smoke, puff by puff. "Each of these is a separate puff," Skinner says. "Then I can look at when we work with flavors, how that's working in the individual puff and the whole smoke." Another machine evaluates how quickly one tastes the flavors and how long they last. Philip Morris' goal is to capture the sensations that appeal to smokers while eliminating what causes disease. "Obviously the incidence of smoking is going down in the U.S., and the best thing that someone can do to reduce their risks of smoking is to quit," Solana says. "So that decline is good for public health and should continue. What will happen in the future I can't predict, but for those people who continue to smoke and choose to smoke, they need an alternative that might reduce their risks." But Matt Myers, president of the Campaign for Tobacco-Free Kids, says that the tobacco industry has misled smokers before with products like light and low-tar cigarettes, and that he is skeptical of their current claims. "We have no reason to believe there is such thing as a safe cigarette," Myers says. "Unless we have an agency that has authority to prevent the tobacco industry from claiming new products are safer, the tobacco industry will continue to market products with claims the public believes gives them an alternative to quitting." Myers says the latest wave of smokeless tobacco products could be having that effect. The major cigarette makers now market snus — a little teabaglike pouch of spitless tobacco that users put between their cheek and gum. Snus is billed as an option for when smokers can't light up. RJReynolds is also test marketing Camel sticks, strips and orbs, all of which dissolve in the mouth. Myers supports legislation pending in Congress that would give the Food and Drug Administration the authority to regulate tobacco. It would impose strict curbs on advertising and limit what companies could say about new products, and also give the agency jurisdiction over the way cigarettes are made and sold. The legislation has been in the works since 1994, when Big Tobacco CEOs made a now-infamous appearance on Capitol Hill to claim under oath that nicotine is not addictive. Today, the companies admit that smoking is addictive and deadly, and the industry leader, Philip Morris, is in favor of the FDA legislation. But critics of the FDA proposal have dubbed it the "Marlboro protection act" — named after Philip Morris' top-selling brand. "It virtually shuts off all competition," says Tommy Payne, vice president at Reynolds American, Philip Morris' closest competitor. "In any circumstance where you shut off competition, the current largest player tends to cement their market share and is the ultimate winner." When the FDA bill passed the House earlier this year, its sponsor was California Democrat Henry Waxman, the congressman who chaired the Big Tobacco hearing 14 years ago. "It's taken a very long time — I think the landscape in this country has changed since that historic hearing," he says of American smoking culture. Indeed, nearly half of U.S. states now have indoor smoking bans, and for the first time since the government started keeping track, the adult smoking rate has dropped below 20 percent. The question is what those remaining addicted smokers will be using in the future, and whether the federal government will have a say in how it's designed.